CALLAHEAD understands our client’s need of variety when choosing a portable sink to make certain of a sanitary environment for themselves, their employees and guests. We are proud to add the WATER BASIN to our already extensive list of portable sink systems to give you many options to assure proper hygiene. The U.S. Center for Disease Control and Prevention has concluded, “Keeping hands clean is one of the most important ways to prevent the spread of infection and illness.” Studies prove that regular proper handwashing can actually save lives, making it a necessity to have washing facilities available at any public setting. The WATER BASIN is CALLAHEAD’s vanity style sink system with double the handwashing capacity, and is ideal for large job sites and events. The WATER BASIN is fully outfitted with two molded-in maintenance-free spigots, two high capacity spray soap dispensers and a lockable single fold paper towel dispenser. Attached is a large trash receptacle promoting users to toss away used paper towels to encourage cleanliness. The large cutouts at the bottom of the WATER BASIN allows for easy access to the two foot pumps for hand free washing and sanitation, fitting even a large work boot. Eliminating the need for risky bags or bladders, the WATER BASIN has two hard sided 45 gallon fresh and grey water tanks so there is no risk of grey water contamination. With handles on all four sides of the WATER BASIN, this unit is easy to maneuver. CALLAHEAD understands that our clients' job sites and special events vary in size and duration. 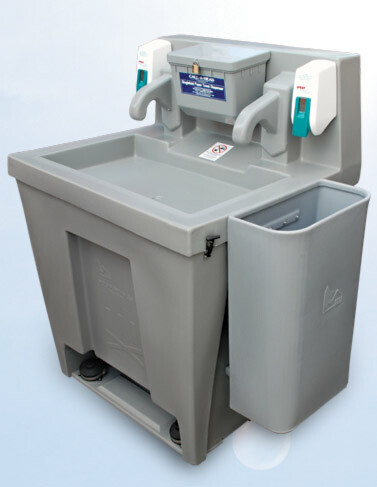 Our goal is to offer our clients every option available in portable sinks to obtain proper hygienic protection for security of a healthier job site or event. With only quality equipment and superior service from a company who cares, CALLAHEAD. No water lines needed for fresh clean water. Appx. # of Uses: 650. Touching a sick or injured person. “Handwashing” is a critical element in proper hygiene as germs can stay alive on hands for up to 3 hours. DUAL WATER SPIGOTS AND FOOT PUMPS! Each person should always use disposable paper towel or their own hand towel. 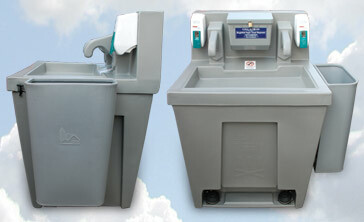 CallAHead Corporation at 1-800-634-2085 offers portable washbasins and sinks for rent. When you want to offer your guests a cleaner environment for your special event or construction site. CallAHead services all of New York City including NYC's five boroughs (Manhattan, Queens, Brooklyn, Bronx, Staten Island) as well as Westchester county and Nassau and Suffolk counties on Long Island. One (1) portable wash station for every 20 construction workers on a job site is recommended by the Centers for Disease Control and Prevention for proper hygiene.